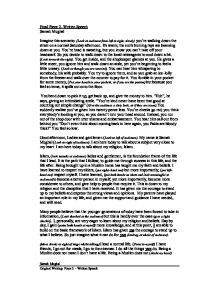 Final Piece 2- Written Speech Samah Mughal Imagine this scenario: (Look at audience from left to right, slowly) you're walking down the street on a normal Saturday afternoon. It's warm; the sun's burning rays are beaming down at you. You're head is sweating, but you know you can't take off your headscarf. So you decide to walk down to the local newsagents to cool down a bit. (Look towards the right). You get inside, and the shopkeeper glances at you. He gives a little sneer, you ignore him and walk down an aisle, yet you're beginning to feel a little uneasy. (Look as though you are worried). You can hear him whispering to somebody, his wife probably. You try to ignore them, and so you grab an ice-lolly from the freezer and walk over the counter to pay for it. You fumble in your pocket for some money, (Put your hands in your pockets, as if you are the person) but because you feel so tense, it spills out onto the floor. You bend down to pick it up, get back up, and give the money to him. ...read more. Many people believe that the younger generations of today have been forced to take in information, (Look shocked at the audience) but this is hardly ever the case (give a light chuckle). I, personally, am very eager to learn about my religion and beliefs. Day by day, I gain (point both hands at myself) more knowledge, and at this point, I am able to build on the basic framework of Islam. Islam has given me the courage to stand up to what I believe. So just imagine what it can do for you (looking at whole of audience). (Move slowly to right of stage whilst talking)I lead a normal life. (Point to myself) I have friends, I go out for meals, I go to the cinemas. I do all the things you do. Being a Muslim does not mean I don't have a life. Being a Muslim does not (shake my head) mean that im totally devoted to my religious prayers, it doesn't (shake my head again) mean I don't have a social life! But it does mean that I can balance (put both hands in front of me and balance them) ...read more. Since that day, over 500 cases of 'anti-Muslim harassment' have been recorded; in America, (look shocked and sickened) the police just about prevented over 300 people from marching on a Mosque. In Los Angeles, a gunman murdered a 48year-old Egyptian shop owner, because he (imitate the two apostrophise with both hands held out in front of me) 'looked' like a Muslim. Even Sikhs and Hindus have been attacked because of how insensitive people mistaken them for Muslims. (Smiling) Being a Muslim means the whole world to me. I (point both fingers at myself) am so thankful to God for me being born in a Muslim home. It has taught me respect, appreciation and gratitude. In return, I have gained respect, which is the best gift I can ever wish for! I'd just like to say, I do hope (look pleadingly at audience) you have taken into account what I have spoken about today. Just always remember that Islam has the meaning Peace, not War,so please respect its religious and cultural issues. Goodbye. (Leave the stage with a smile and positive attitude). Delivery Dierctions xxxx - emphasise strongly on these words. (look to left) - indicates stage directions made by Reader. 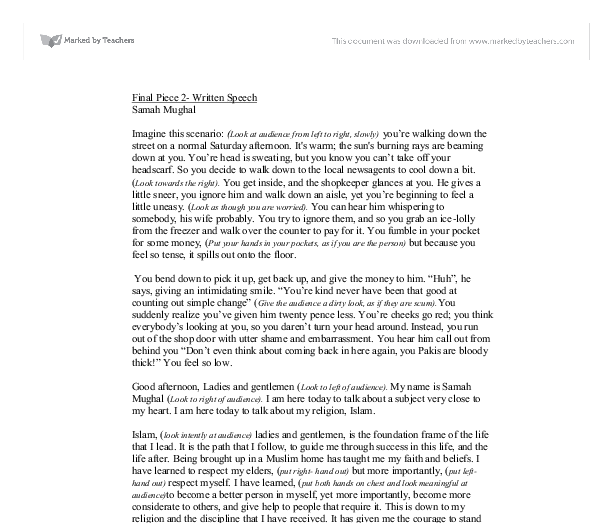 Samah Mughal Original Writing- Piece 2 - Written Speech ...read more. Judy has always been more outgoing than Jo but now they spend more time together in adult life, they have a much better relationship and Jo is becoming more like Judy in her 'rebellious' ways. Vi is Jo and Judy's mother. We also did this with Birdboot which was interesting as Birdboot is a very paranoid person .It was interesting to see how he reacted to pressure. After this we were placed in groups of two or three and were asked to create and off text improvisation using any characters from the play. On the Waterfront &amp;quot;Famous Speech&amp;quot;. Unlike many of the other scenes in "On the Waterfront", the camera barely moves at all, but instead keeps both of the conversationalists participating in the shot at once. And in the same breath she said: "I want to talk to you for just a minute about what do you gain if you gain the whole world yet lose your own soul" With remarkable deft and ease Joyce used this technique to pitch her message within the variable frames of understanding and cognition obtainable amongst the audience.